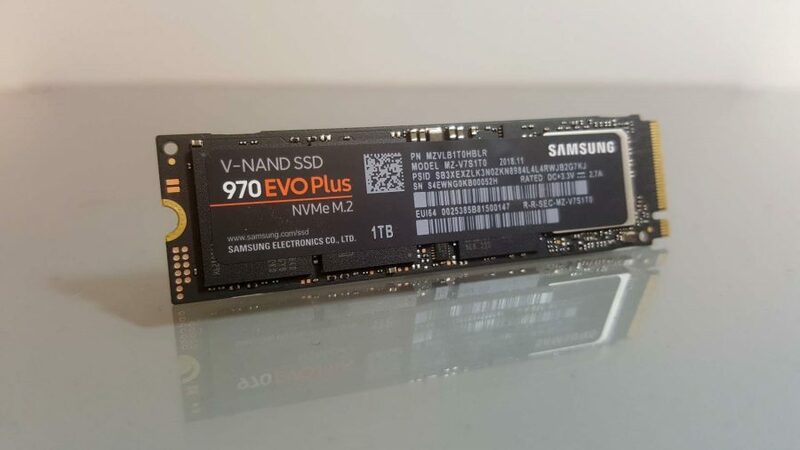 Why can’t all PC hardware be like the Samsung 970 EVO Plus SSD? Things would just be so much better. We wouldn’t mind having constant, iterative releases of graphics cards if they were ever cheaper at launch. We honestly wouldn’t mind a drop in demand and an oversupply of hardware delivering price decreases on new products. We wouldn’t mind companies passing those manufacturing savings on to us. With the solid state drives of today we’re getting higher performance at getting on for half the price of the same capacity this time last year. 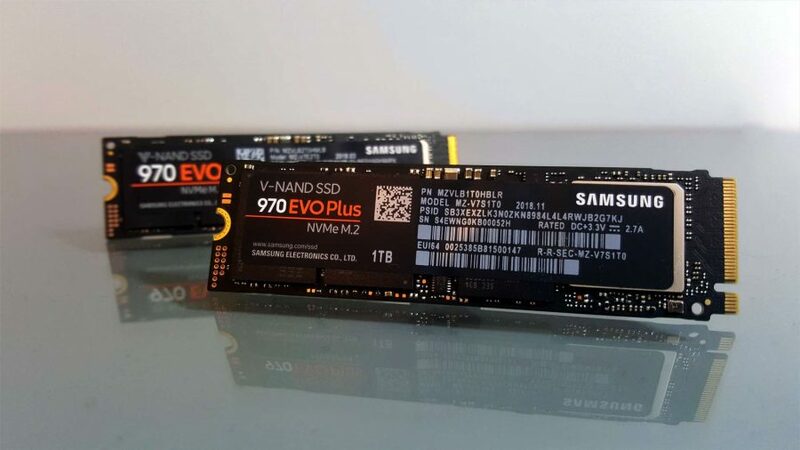 The new Samsung 970 EVO Plus is the perfect case in point – when Samsung unveiled the 970 EVO last year the NVMe drive was one of the fastest available and the 1TB version cost a princely £376 at launch, now the faster 970 EVO Plus is here costing just £234. Now, this isn’t purely down to the benevolence of our Samsung overlords – Apple’s iPhone decline and subsequent global oversupply of NAND has driven component pricing down – but you’re still getting a more powerful product than the previous SSD without the same level of wallet tax. And that’s a rarity in these tough times of ours. The original Samsung 970 EVO was introduced in May last year, sporting the new Phoenix memory controller and DDR4 cache memory. The new Phoenix controller was essentially the same basic design as the Polaris silicon which preceded it in the 960 EVO, but the clock speed was bumped up just enough to give the newer SSD a little extra in the way of straight line storage performance. So, what’s changed with the new 970 EVO Plus? 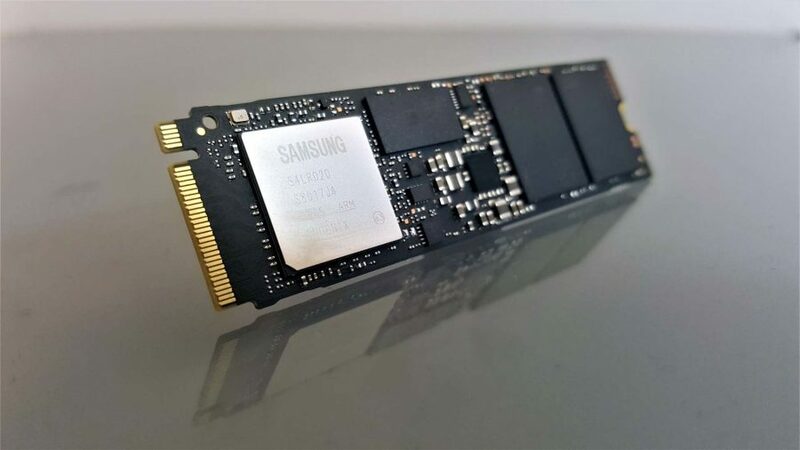 As you might imagine from the minor tweak to the Samsung’s SSD nomenclature this is very much just an evolution on the previous design rather than a whole new generation of solid state drive. We’re still looking at the same Phoenix memory controller, with the same Intelligent Turbowrite goodness, and 3-bit MLC (read: TLC) NAND flash memory onboard, but Samsung is calling out firmware optimisations in the controller and the latest V5 of its 3D V-NAND tech as being responsible for the higher performance of the 970 EVO Plus. That’s the ‘Plus’ bit, by the way. The combination of the optimised Phoenix controller and the latest memory means that Samsung is rating the sequential performance of the new drive at 3,500MB/s and 3,300MB/s for reads and writes respectively. On the read side that’s only a shade faster than the 1TB version of the standard EVO, but the write performance has been massively increased, by 800MB/s. And it’s probably a pretty fair bet that it’s going to be right. Even the new WD Black SN750 drive, again with its own memory controller, is a shade behind the EVO Plus at launch. The WD Black SN750’s 1TB drive is rated at 3,470MB/s and 3,000MB/s for its reads and writes, which is fast, but not quite at the same level as the Samsung drive. But WD is probably Samsung’s closest competition in terms of SSD performance, with Crucial more often placing as the value proposition. Aside from the updated controller and memory of the Samsung 970 EVO Plus SSD, it has also taken steps to knock back the heat levels of the drive. With NVMe SSDs overheating can be a problem and can often lead to throttling. It was a problem with Samsung’s first NVMe drives, but has been mitigated in the later generations. But still, the 970 EVO was hitting 75°C in our testing – which is pretty toasty – and that’s partly down to the higher clock speed of the Phoenix controller. The 960 EVO, with its slower Polaris silicon, only ran up to 61°C. Samsung has added a nickel coating to the Phoenix chip on the 970 EVO Plus, however, which is designed to help dissipate heat faster under load. It has made a little difference in our testing, as even under heavy usage the newer drive only gets up to 69°C as a maximum. 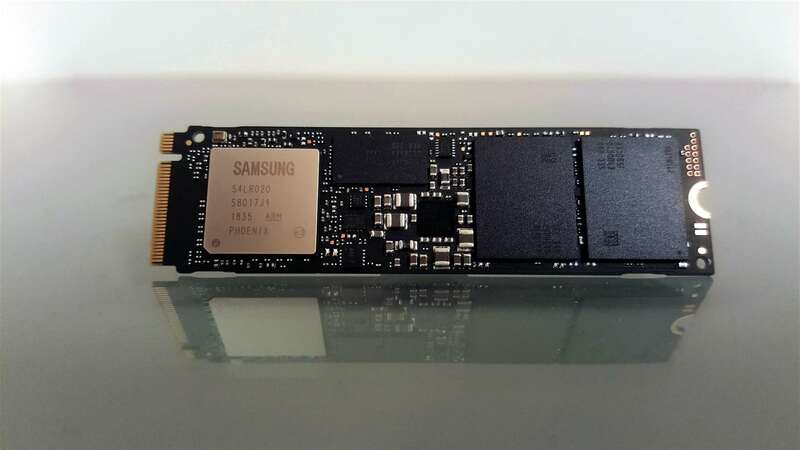 And in terms of capacity we’re looking at 250GB, 500GB, and 1TB units at launch, with a 2TB drive coming in April with the new 512Gb Samsung V-NAND Flash memory. But the most important numbers are those old storage benchmark figures, right? So, can it manage to deliver on those impressive sequential performance numbers? Almost. The straight ATTO benchmark gave us sequential read/write speeds of 3,487MB/s and 3,174MB/s. That puts it only a little shy of the specs sheet numbers on the reads, but a bit further off on the touted write performance. Across the board that’s still far higher sequential benchmarking that we’ve seen in any other SSD that’s ever crossed our test bench. That isn’t quite the case with the AS SSD tests which operate using incompressible data to counter any smart compression algorithms the Samsung drive might be using. The read performance actually comes out below the level the standard 970 EVO drive shows, which seems rather odd. But the write performance is still comfortably quicker than anything we’ve ever seen, even faster than the 2-bit MLC powered 970 Pro drive launched last year. It’s a mixed bag when it comes to the little 4k read/write tests too. Here the tiny little file transfer test, which we use to give an approximation of how slick it will feel as an OS drive, shows up the fastest read speeds we’ve seen outside of Intel’s advanced 3D XPoint memory. But, despite the higher write performance displayed elsewhere the 4k write speeds are pretty average for a Samsung NVMe SSD. In terms of the real-world performance, however, the Samsung 970 EVO Plus is right there at the top again. The 5GB file compression test is a shade quicker than the standard 970 EVO, and the full 30GB mixed file folder transfer is the fastest around… except for that 3D XPoint Intel SSD 905p. Though that is around twice the price for half the capacity, which I think still puts then Samsung ahead. Samsung isn’t messing around with the new 970 EVO Plus. It is the fastest consumer SSD around, and comes in at a fantastic price. It also shows we’re almost at the point that SATA drives have been at for a while, those SSDs bumping their heads at immovable 600MB/s performance ceiling. With the rated performance of the 970 EVO Plus getting close to the theoretical limits of the PCIe 3.0 M.2 interface it’s hard to imagine an SSD coming out with higher sequential speeds any time soon. But with the PCIe 4.0 era about to start, with the AMD 3rd Gen Ryzen processors set to sit in new, PCIe 4.0-enabled, X570 motherboards you can bet that the likes of Samsung, Micron, and WD are all looking at how they go about getting drives beyond the 4GB/s mark. That 'Plus' bit in the title is what gives the new Sammy drive the edge over its forebears, touching the performance limits of the x4 PCIe 3.0 interface. But it's the decline in memory pricing which means this super-speedy 1TB drive is an incredible price even at launch.